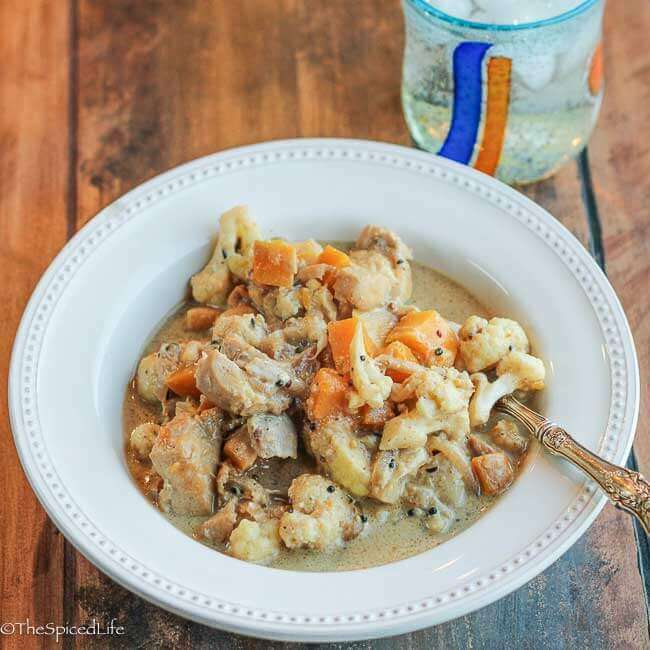 This Bengali Chicken, Butternut Squash and Cauliflower with Coconut and Mustard knocks it out of the park! 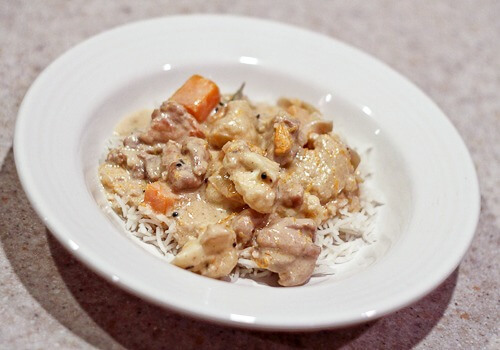 For being a relatively mild dish, it packs a wallop of flavor! I made this dish again and updated the photos in November 2015. The curry was as fantastic as I remembered! A copy of The Bengali Five Spice Chronicles was sent to me in exchange for an honest review. Affiliate links have been used in this post to link to items I am discussing. I am writing this in between bouts of codeine-induced dizziness. And how has your December been? I got my flu shot late (note to self–it takes 4 weeks to give you full protection so do not leave it until mid November) and after about 7 days of the influenza, I got better for about 48 hours and now have strep throat. Combined with the residual coughing from the flu, the doctor told me today my throat is actually bleeding. UGH. So yeah, codeine. Which has worn off, but it is 1 in the morning and I will need another dose soon. So I am writing while I am (I think) coherent!I promised you guys another post about Rinku’s fabulous new book, The Bengali Five Spice Chronicles , and (drumroll) a giveaway! The publisher very generously agreed to give a copy of her book to one of my readers–this giveaway is now closed. Thanks to everyone who entered! For an example of my photography circa 2012! OK now about the dish itself. This one is hands down my favorite yet (and that is saying something!). I adapted this one a bit more than the others, because with being sick I really only wanted to make one dish. In her book, it is listed as a winter squash dish and suggests the alternatives of eggplant or cauliflower. Because I knew I would be serving it on rice, I wanted to reduce the carbs (butternut squash), add the cauliflower and add a protein (the chicken). The seasoning–totally unique to me–I left as is, so I think my dish remains true to the spirit of the original. Guys I thought this dish would last a few days but it was gone in 24 hours. Absolutely delicious. It is meant to be spicy, but I left out the chile peppers because of my kids–so that blob of red you see on my plate is sambal olek to give it some more kick. Also, because I was sick I used (Rinku’s suggestion of) Dijon mustard with salt (and minced chile peppers, which I again left out) in place of the fresh mustard seed paste. If you cannot find mustard oil, I would advocate increasing the mustard seeds and the Dijon mustard both to give the dish some oomph. Before I sign off and go take that next dose of cough medicine, I wanted to share a few things with you guys. The first–and most exciting–is that I have joined Kitchen Play’s new program: Cookbook Tour. 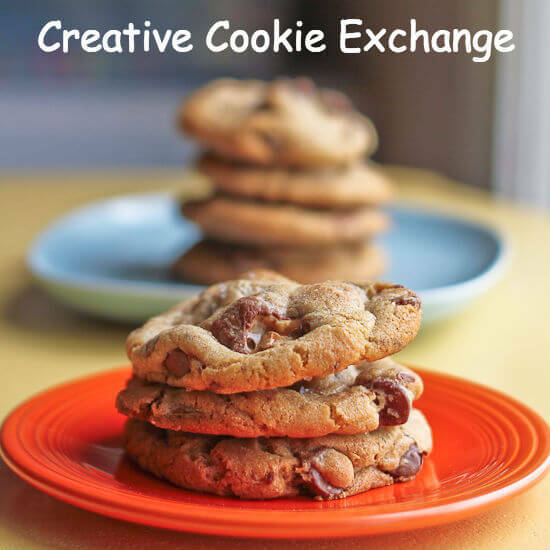 It is an innovation program aimed at both supporting food blogging cookbook authors and exploring the idea that food bloggers are crucial in cookbook PR. You guys know how I feel about that–I’ve been reviewing cookbooks on this site for forever. Our first book, which I will be posting about in the upcoming weeks, is Faith‘s An Edible Mosaic: Middle Eastern Fare with Extraordinary Flair , a cookbook I am super excited to cook from! I hope you check out the other bloggers working with me–we will be all featuring Faith’s book in different yet complementary ways throughout December and January (you can find links to them through the Kitchen Play link above). The second bit of news is that because the Cookbook Tour is an actual project exploring how useful we as bloggers are to the cookbook PR industry, I will be using Amazon Affiliate links for the cookbooks I talk about. I do receive a small portion of anything you buy through my links, but I will only be linking to cookbooks I would have been writing about anyway. The primary purpose of the links is so Casey over at Kitchen Play has a way to track sales from the blogs involved in the cookbook tour. Because I am curious, I will probably just get in the habit of using the affiliate links for any cookbook I talk about (for example, I did for Rinku’s book above). OK, wish me cough-free rest and I hope you are getting holiday baking done! I managed to get some done in between the flu and the strep, and I now have some great cookies to share with you guys! Heat the oil in a large Dutch oven over medium heat. Add the mustard seeds and caraway seeds. Partially cover the pot to allow the mustard seeds to pop. 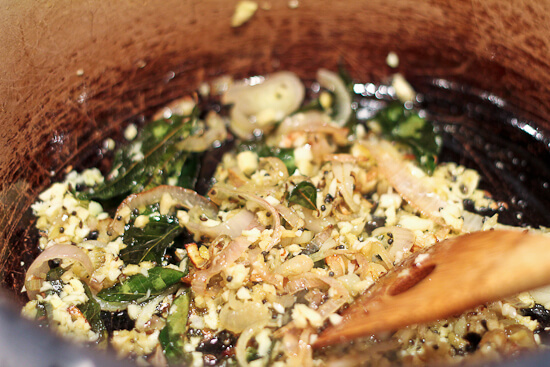 When the popping slows, add the curry leaves--stand back they will splatter! When the splattering slows, add the shallots with a sprinkle of salt. Cook for 3 minutes. Add the garlic and ginger and stir. Cook for another 2 minutes. Add the chicken with a pinch of salt and stir in. Then let cook for 1 minute without stirring. 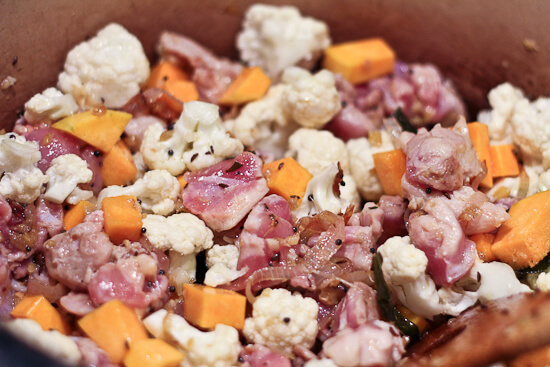 Then toss in the butternut squash (if using) and cauliflower. Cook for 1 minute. Add the sugar with a pinch of salt (and the green chile peppers if using) and toss, cooking for 5-7 minutes. Add the yogurt and mix in completely. Cook until the excess liquid from the yogurt is absorbed. Stir in the Dijon mustard and coconut milk. Bring to a simmer. Cover partially and simmer gently for 15 minutes until the chicken and veggies are cooked through. Stir in 1 teaspoon of garam masala and 1 tablespoon of lime juice. Taste for additional salt, garam masala or lime juice. Serve with basmati rice. And for those who like collages…. I love how veggie-ful and flavorful this dish is! I’m sure it’s like an explosion with every bite. I’m not sure what the name of my favorite indian dish is. I know it is green. Not very spicy. It had herbs in it that were unexpected to me (cilantro, parsley, basil). It was so delicious. I left a comment for Rinku. I struggle too with having a 3 year year old who can’t eat things as spicy as we do. I guess we’ve lost a lot of our tastebuds. Sometimes in a recipe like this I will end up sauteing some chicken separately so we can eat the spicy version 😉 Otherwise I try not to cook two dinners…. I’ve always liked Gobi Mattar. This recipe looks different from other dishes I’ve made, might have to try it sometime! I like a lot of Indian dishes, but I turn to biryanis when blue or stressed. Like The Spiced Life on FB. Commented on Rinku’s site as well. i’m not at all familar with indian food so would love to win the cookbook to learn more. First, I hope you feel better soon, Laura! It’s not fun to be sick during the holidays. Second, these dishes you have here are all amazing. 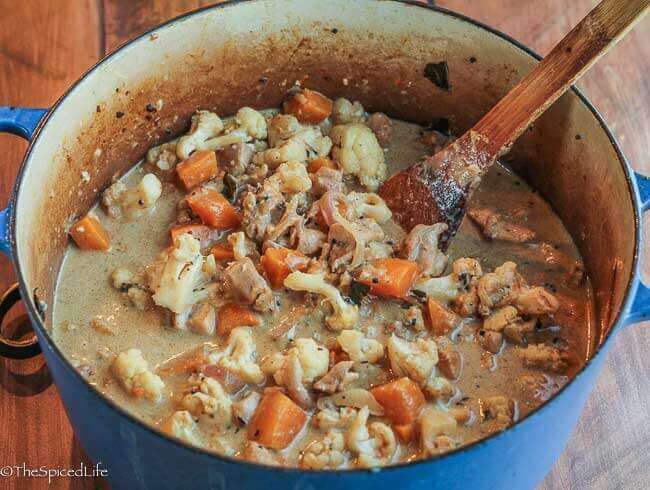 I must bookmark this chicken and cauliflower with coconut – it sounds delish. My fave Indian dish is Chicken Tandoori. And I already follow you on Twitter and FB, just so you know. Thanks for the nice blog-visit. Glad to join this group hoping to win a giveaway! This sounds so yummy. What an incredible mix of flavors. We are big fans of anything tandoori, with lots of naan. Hope you feel better soon!!! Oh, Laura, you poor thing…feel better soon! And enjoy this comforting dish while you recuperate. I have never tried Indian food and this cookbook would help change that!